Do you love my buns? The recipe is here. When my friends at Anolon approached me and asked if I'd develop a recipe for them for their "Start from Scratch" campaign, I was all over it. I cook from scratch much more often than I cook from boxes, bags and mixes. When I saw the list of suggested recipes, I chose barbecue. This recipe is more from-scratch than the sauces that typically start with something like ketchup, or even canned tomato sauce. Oh, no. This sauce starts with fresh tomatoes. It doesn't get any more from-scratch than that, unless you happened to grow the tomatoes yourself. The sauce takes quite a bit of time to cook and reduce, but this is something you want to do slowly. Don't rush it ... good things take time. The resulting sauce is rich, deep, luxurious, with a sweet, tart, and savory all wrapped up in one bite. And then I made it better by roasting some pork and making barbecue pork sandwiches. Seriously, you WANT one of these. Hint: If you're avoiding wheat ... try barbecue nachos. Seriously. When I was a kid, barbecue at home usually came with potato chips (and I still tend to serve them with barbecue sandwiches. These days, I'm much more likely to have tortilla chips on hand rather than potato chips. So, I thought, why not serve those barbecue pork sandwiches with a side of tortilla chips and cole slaw? As part of this campaign I was able to choose an Anolon pot to work with, and I chose the 5.5 quart covered braiser. Not only was it perfect for cooking the pork roast that ended up in the sandwiches, but it also was perfect for simmering and reducing my sauce. The wide, flat surface let the liquid reduce quickly, and the heavy bottom meant that it heated evenly. The braiser has a round wire rack that can be used to keep food off the bottom of the pot - as when I used to to roast my pork. But if you don't use it in the pot, it makes a great trivet, too. Or a cooling rack. Although it's not part of my barbecue recipe, the pot is also pretty nice for steaming corn on the cob. Steaming cooks faster, and less water means it heats faster. I also used the pot for steaming eggs. Which might sound a little crazy, but I ended up with perfect hard-boiled eggs. One lucky reader can get a set of Anolon Advanced cookware that you can find at Macy's right now for $299, if you're in a buying mood. The set includes: 1.5 Qt. Covered Saucepan, 3 Qt. Covered Saucepan, 8 Qt. Covered Stockpot, 8.5" Skillet, 12" Covered Deep Skillet, 3 Qt. Covered Saute. 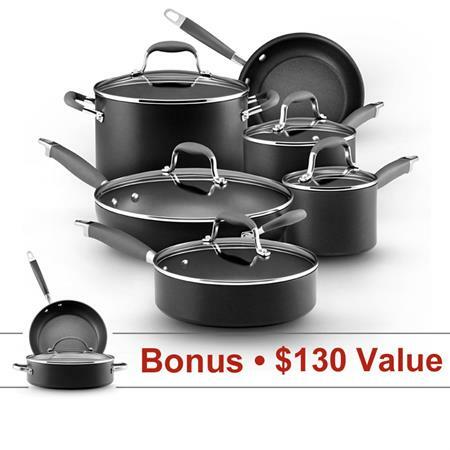 Bonus Items are: 10" Open Skillet, 3 Qt. Covered Sauteuse with swing lid. I own several pieces of Anolon cookware from different product lines, and I have to say that the Advanced line is pretty sweet. It's nonstick, but it's also safe for use with metal utensils. And, the color is classy, with the dark gray and silver. It just looks good on my stove, and it cleans up easily, both inside and out. If you win this set, you're gonna love it! Or someone is gonna love you very much if you give it as a present. Christmas is coming. The giveaway is now OVER. 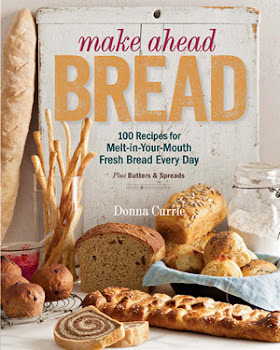 And don't forget to check out my recipe, available at Anolon.com. Because you really do want this pork sandwich in your life. Yeah, that's what I'm talking about! About this campaign: Anolon sponsored the Start from Scratch campaign to encourage home cooks to consider making a wider range of foods from scratch. From August 13-31, Anolon’s Facebook, Twitter, and Pinterest social media sites will promote the campaign, with opportunities for you to win Anolon cookware prizes. There is also a special 20 percent off promotion on Anolon open stock items available at Macy’s. I am a paid participant in this campaign.